Guess what I spotted in this year's February issue of Japanese fashion magazine Spring! Field Notes Ambition! You can see it in the upper left corner in the picture above. As some of you may know, planning notebooks and journals are a serious business in Japan. At the end of every year, department stores and bookstores dedicate huge sections of their shops for next year’s planners. Even casual fashion magazines like Spring publish a spread or two on notable journals and notebooks, too. It’s interesting that the Field Notes edition featured here is Ambition, a past edition from a year ago (winter 2014 to be specific). I guess it makes sense, since the topic is planners, and Ambition is the only Colors edition so far to have the weekly planner format. But it made me wonder how readily available Field Notes Colors editions are in Japan and how well they sell. You know, the marketing/business side of things. Are there even Ambition 3-packs still left on store shelves there, for a mainstream magazine to feature it? If you’re a Field Notes fan living in Japan, I’d love to hear your shopping experience and how well the Field Notes brand is received in the stationery community there! The short blurb on Field Notes at the bottom of the page isn’t anything revelatory, just a basic intro of the brand and the fact that Ambition is a variety pack. But it was still interesting to see my favorite notebooks in a different context, for a different audience in what I assume to be a more competitive market. And I was tickled this was in a women's magazine. My impression so far is that Field Notes in America tend to get marketed towards men, or more often sold in men's shops. So to see Field Notes marketed towards women in Japan, while I'm sure they have been featured in men's magazines too, is pretty neat. 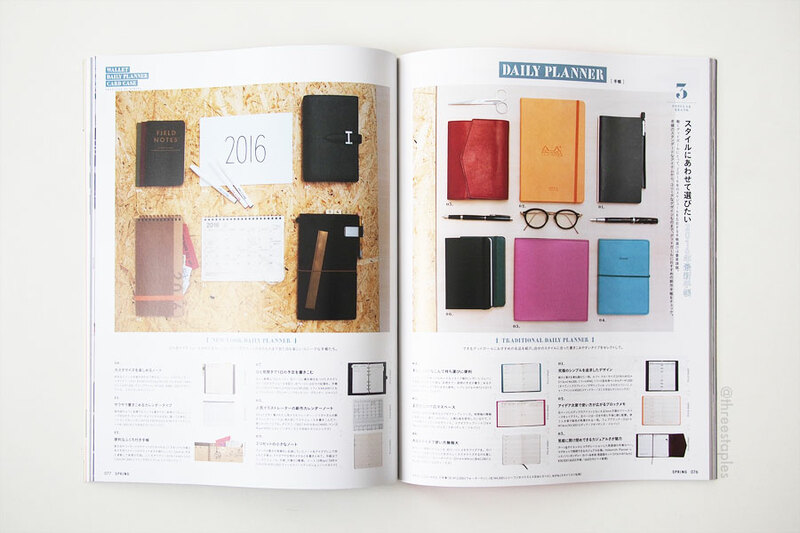 Interestingly, Field Notes Ambition is featured under the group “New-look Daily Planner” along with: Franklin Planner, Noritake, and Traveler's Company. Some included in the “Traditional Daily Planner” group are: Knox, Rhodia, Hobonichi, Hightide, Quo Vadis, and Moleskine. It's an interesting mix of Japanese brands and non-Japanese brands, with some of the names we're already familiar with. PPS: In case you missed it on my Twitter last year, here is another example of a Field Notes sighting, in a Japanese fashion magazine called Sweet (published by the same company as this Spring magazine). It's just used as a prop though; judging from the texture on the cover, it looks like it's a Butcher Orange, which is quite an old one to be featured in a magazine recently.